If you're announcing your run for the presidency, you probably hope by evening you're not being compared with a notorious serial killer. But that's exactly what happened to Congresswoman Michele Bachmann when she got her John Waynes seriously mixed up yesterday. Unfortunately the John Wayne she meant was born in Winterset, Iowa, which is more than 100 miles from Waterloo. The John Wayne of Waterloo was a homophobic serial killer who was known for his creepy compulsion to dress up as a clown. Twitter exploded with derisive laughter after her gaffe, and the news cycle was suddenly full of roughly photoshopped images of a smiling Bachmann wearing clowns makeup. It was a rough enough welcome to the big leagues. "Are you a flake?" Fox News' Chris Wallace asked her on a fairly hostile Fox News Sunday. 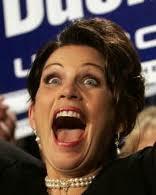 'I think that would be insulting to say something like that because I’m a serious person,' Bachmann replied testily. She did not accept his apology, which was delivered via a web video the next day. Social conservatives love her, and the Tea Party seem to think she's now the candidate to beat, but the majority of the American electorate may be a tough sell. Why? Because she's so gaffe prone (which reminds us all of someone) because she often seems to deliberately mislead the public with her statements, and because her rhetoric is often completely absurd. "Carbon dioxide is portrayed as harmful. But there isn't even one study that can be produced that shows that carbon dioxide is a harmful gas." "(Gay marriage) is probably the biggest issue that will impact our state and our nation in the last, at least, thirty years. I am not understating that." Perhaps in future she'll beware of grandiose announcements, but I somehow doubt it.